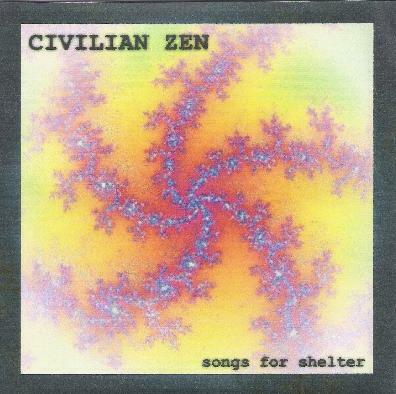 Civilian Zen - "Songs for Shelter"
Songs for Shelter is a multi-musician project organized by Keith Hill for the Shelter Charity in the UK (limited edition of 150 copies). In addition to Hill, participants include Nik Turner, Ron Tree, Judge Trev, Jerry Richards, Alf Hardy, Neil Whitehead, Phil Howard and others. The CD opens with "Wanderland", a short spacey/proggy intro piece. This leads into the aptly titled "Astronaut Talk", a heavy rocking Hawkwind inspired space rock track and an excellent tune. Nik Turner participates on two tracks - covers of "Welcome to Utopia" and "Welcome to the Future", and both are excellent interpretations, especially the hard rocking "Welcome to the Future". Great guitars and spitfire electro groove. Other highlights on this 19 track CD includes "Submillimetre Valley", another impressive Hawkwind styled tune with a steady rocking rhythmic pace, haunting efx'd vocals and well placed guitar and electronic effects. Jerry Richards and Alf Hardy shine on "Jackyl Headed Women", with it's heavy space rock mixed with electronic dance grooves theme. "Attackyon" parts one and two are both intense tracks with a ready-for-attack invasion feel and evil vocals from Ron Tree. At 7+ minutes, "Ancient Voices" is the longest track of the set, combining elements of Hawkwind styled space rock, progressive rock and electronica. A great combination of heavy space rock, deep space drift, trippy psychedelia and freaky sound fun. "A Wipeout in the Waves" is yet another cool cosmic rocker and includes ripping guitar from Judge Trev. And "Sublime Revelation" is a short Calvert-esque spoken word piece that makes for an intro to the dreamy drifty droney mind-bending "Beneath the Clouds". Rounding out the set are a number of tracks, mostly by Keith Hill, that cover a variety of territory, from deep space keyboard and electronic driven tracks, to atmospheric cosmic world music, to colorful landscape painting space rock. And I like the way Keith weaves these in with all the other tracks, making for a varied but seamlessly interconnected set. Overall an excellent space rock set and for a good cause too! Did you notice at the beginning I pointed out this is a limited edition of only 150? For more information you can email: keithmethod@hotmail.com.